New Employment Laws and regulations went in to effect January 1st, 2018. Find them below, and contact Stone | Dean’s Employment Law Practice Group for help updating your employment practices. All employers with five (5) or more employees are prohibited from including on any employment application a question that seeks disclosure of the applicant’s criminal history. The employer cannot “inquire” or “consider” an applicant’s conviction history until after a conditional offer of employment has been made. This also means employers cannot use background checks that reveal criminal conviction history until after an offer is made. If an employer intends to deny employment to an application because of an applicant’s conviction history, whether in whole or in part, it must make an individualized assessment of whether the applicant’s conviction history has a direct and adverse relationship with the specific duties of the job that justify denying the applicant the position. The employer shall consider: (1) the nature and gravity of the offense or conduct; (2) the time that has passed since the offense or conduct and completion of the sentence; and (3) the nature of the job held or sought. This assessment may or may not memorialized in writing. If the employer makes a preliminary decision that the applicant’s conviction history disqualifies the applicant from employment, the employer shall notify the applicant of this preliminary decision in writing. The notification shall contain: (1) notice of the disqualifying conviction or convictions that are the basis for the preliminary decision to rescind the offer; (2) a copy of the conviction history report, if any; and (3) an explanation of the applicant’s right to respond to the notice of the employer’s preliminary decision before that decision becomes final and the deadline by which to respond. The explanation shall inform the applicant that the response may include submission of evidence challenging the accuracy of the conviction history report that is the basis for rescinding the offer, evidence of rehabilitation or mitigating circumstances, or both. The applicant has at least five (5) business days to respond to the notice provided to the applicant before the employer may make a final decision. The applicant’s response may dispute the accuracy of the conviction history report that was the basis for the preliminary decision to rescind the offer. If the applicant states he/she is taking specific steps to obtain evidence supporting his/her dispute, then the applicant has five (5) additional business days to respond with the evidence. If an employer makes a final decision to deny an application solely or in part because of the applicant’s conviction history, the employer shall notify the applicant in writing. The notice must include: (1) the final denial or disqualification; (2) any existing procedure the employer has for the applicant to challenge the decision or request reconsideration; and (3) the right to file a complaint with the Department of Fair Employment and Housing. An employer may not seek salary history information about an applicant for employment. “Salary history information” including compensation and benefits. The new law does not prohibit an applicant from voluntarily and without prompting disclosing salary history information to a prospective employer. If an applicant voluntarily and without prompting discloses salary history information to a prospective employer, the employer may consider or rely on that information in determining the salary for that applicant. If an applicant asks the pay scale for a position, the employer must provide it. A covered employer has between 20 and 49 employees with 75 miles of each other. A covered employee has more than 12 months of service with the employer, and at least 1,250 hours of service with the employer during the previous 12-month period. While the leave is unpaid, the employee is entitled to use any accrued vacation pay, paid sick time, or other accrued paid time off. In addition, the employer must maintain group health coverage during the leave at the same level and under the same conditions that would have been provided had the employee continued to work. Under current federal immigration law, when federal immigration authorities visit a worksite to perform enforcement activity, the employer may allow authorities to access nonpublic portions of the worksite voluntarily or requiring a warrant. California’s new law removes the employer’s ability to voluntarily allow access to nonpublic portions of the worksite. The Labor Commissioner or Attorney General have exclusive authority to enforce this new law. Thus, there is no private right of action under the California Labor Code’s Private Attorneys General Act. Civil penalties range from $2,000-5,000 for the first violation and $5,000-10,000 for each subsequent violation. The new law also prevents employers from voluntarily providing immigration enforcement agents to access employee records without a subpoena or judicial warrant. This section does not apply to I-9 forms for which a Notice of Inspection has been provided to the employer. If an employer receives of any Notices of inspections of I-9 Employment Eligibility Verification forms or other employment records from an immigration agency, it must provide employees notice of the inspection within 72 hours of receiving notice. The notice must be hand-delivered at the worksite if possible, or by mail or email if hand delivery is not possible. An employee or the Labor Commissioner may obtain a preliminary injunction order compelling the employer to reinstate an employee pending the resolution of the employee’s retaliation lawsuit. Meaning, an employer may be required to re-hire an employee during the time it takes to litigate the employee’s claim that he/she was subject to unlawful retaliation, which usually takes no less a year or more. Moreover, the new law drastically reduces the burden of proof for injunctive relief in retaliation cases. The general standard for a temporary restraining order or permanent injunction requires the party to prove (1) irreparable harm if the injunction is not granted, (2) likelihood of the success on the merits of the claim, and (3) these interests outweigh whatever harm the defendant will suffer if an injunction is granted. Now, injunctive relief shall be granted if the individual makes a mere showing that “reasonable cause” exists to believe the employee was unlawfully terminated or subjected to an adverse action. In addition to handing employees a much lower burden of proof than other forms of injunctive relief, the court must consider “the chilling effect on other employees asserting their rights under those laws in determining if temporary injunctive relief is just and proper.” Thus, the court must consider an entirely new factor that only favors the employees. The Employment Development Department made changes to DE 2320 For Your Benefit and the Paid Family Leave pamphlets. DE 2320 must be distributed to an employee upon termination or lay off, or on a leave of absence. Paid Family Leave no longer has a seven-day waiting period. The current versions can be found at http://www.edd.ca.gov/pdf_pub_ctr/de2320.pdf and http://www.edd.ca.gov/pdf_pub_ctr/de2511.pdf. All employers must provide new employees with written notice about the rights of victims of domestic violence, sexual assault and stalking to take protected time off for medical treatment or legal proceedings. The pamphlet can be found at http://www.dir.ca.gov/dlse/Victims_of_Domestic_Violence_Leave_Notice.pdf. The Department of Fair Employment and Housing developed a new transgender rights poster. All employers with five (5) or more employees must post this information. 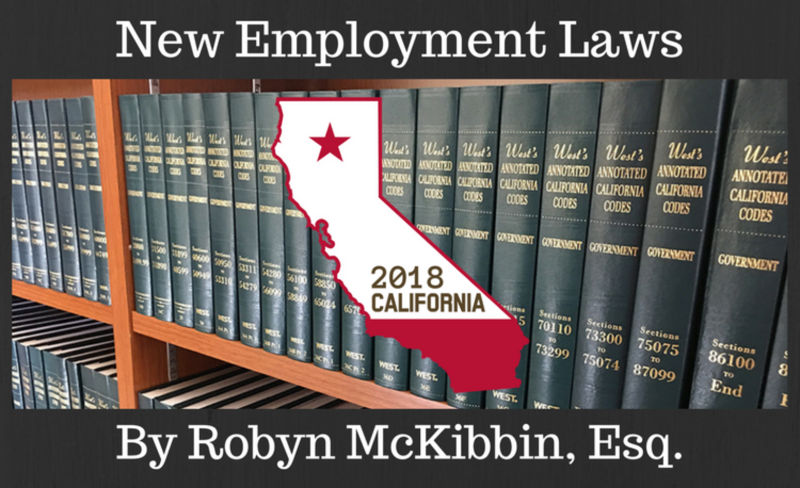 If you order the federal and state law employment poster updated annually and published by the California Chamber of Commerce, the information is contained therein. Otherwise, the poster can be found at: https://www.dfeh.ca.gov/wp-content/uploads/sites/32/2017/11/DFEH_E04P-ENG-2017Nov.pdf. Also, employers should familiarize themselves with California’s new identification documentation. California identification cards, birth certificates and driver’s licenses can include one (1) of three (3) gender options: female, male or nonbinary. They will be phased in beginning September 1, 2018, for birth certificates, and January 1, 2019, for driver’s licenses. For employers with 26 or more employees, the state minimum wage increased to $11/hour. For employers with 25 or fewer employees, the state minimum wage increased to $10.50/hour. The minimum salary threshold for executive, administrative and professional exemptions increased for 2018. The threshold is based on the state minimum wage, not any local minimum wage. The minimum monthly salary exemption for employers with 26 or more employees is $3,813.33/month ($45,760/year). For employers with 25 or fewer employees, the minimum monthly salary exemption is $3,640/month ($43,680/year). The 2018 IRS Mileage Rate increased to 54.5 cents/mile for business travel. L.A. City enacted an ordinance requiring 48 hours of paid sick leave per year, doubling California’s sick pay law. Unlike the state law which contains exceptions for certain occupations such as construction workers, certain home health workers, flight crews and workers covered by union agreements, the L.A. ordinance contains no exceptions. Employers with 26 or more employees were required to comply by July 1, 2016. Employers with 25 or less employees were required to comply by July 1, 2017. Paid sick leave accrues on the first day of employment and may be used beginning on the 90th day. Employers may either grant a lump sum (“front-load”) of paid sick leave or have it accrue at the rate of one (1) hour of sick leave for every 30 hours worked. However, the state law has additional accrual options not allowed by the L.A. ordinance. Further, under the front-load approach, state law provides that there is no carry over of unused sick time. The L.A. ordinance holds that up to 72 hours must carry over year to year but it does not state whether this carry over requirement applies to front-load plans. Like state law, unused sick leave need not be paid out upon separation. If an employee separates and is rehired within one (1) year, any unused sick time must be reinstated. Unlike, state law, the L.A. ordinance does not have an exception to reinstatement if paid sick leave was paid out upon separation, i.e., under a PTO policy.